Touch Thai with Thai House and friendly Thai Hospitality. We are one of the minority Thai style guesthouse which located in the district of the old town.You will impress and touch Thai here. Just only nine different private rooms and one share room with a simple perfection for travelers who love Thai experience. Clean and cozy Thai House with friendly staff, we try to make you feel at home with homey Thai style warm welcome. 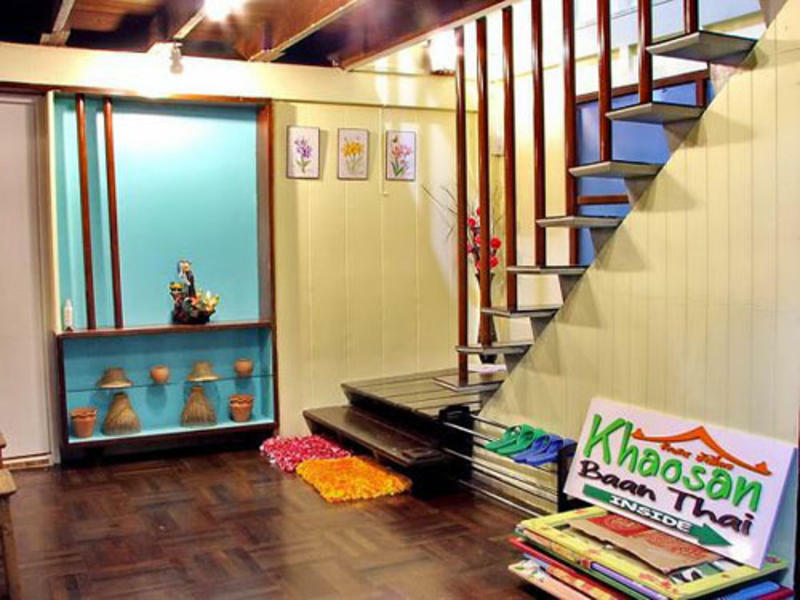 Khaosan Baan Thai is a small two storey Thai house built with teak wood at the age of 60 years. The house was renovated to a new and charming and safety stay, located in the district of the Old Town. We filled this house by heart. Happiness is all around you here. According to the old house structure, no rooms are ensuite. We have only shared 4 clean bathrooms with hot & cold shower. - 1 room of Basic Single Private: A private tiny cozy 'White Color' standard single-bed room with fan. - 1 room of Basic 2 Bed Mixed Dorm: Tiny cozy white share room with fan. BUNK BED for 2 persons. - 2 rooms of Twin Private: Private lovely blue twin bed rooms with fans. - 1 rooms of Standard Twin Private: Shiny green private twin bed room with fan, view and patio. Add 1 extra bed is 200 Baht. - 4 rooms of Deluxe Twin Private: Charming cozy private twin bed rooms with Air-conditions. Add 1 extra bed is 280 Baht. - 1 room of Superior Twin Private: Lively pink private twin bed room with view and Air-condition. Add 1 extra bed is 280 Baht. 1. By meter taxi : contact to the taxi counter on 1st floor, outside of the airport exit, state your destination. There is 50 baht surcharge on the meter (per a taxi). In addition, you have to pay for 2 expressway fee 70 baht. The meter should run up to 300-350 baht and it takes approx. 50-100 mins. depending on the traffic. 2. By Airport Rail Link (SA City Line) from Suvarnabhumi Airport (every 15 minutes, since 6:00-24.00) to Phayathai Station. It's 45 baht, around half hour. After that you can take taxi or Tuk-Tuk around 70-120 baht. to Khaosan Baan Thai. Anyway from Khaosan Baan Thai to the airport. We service Airport transfer by Van at 150- bath and Taxi transfer with no surcharge at 450- baht to the airport. Ten minutes walk, walk down the road to Banglunpoo Junction to Samsen Soi3. Seven-eleven is on at the corner. Walk 200 m. through Samsen Soi3 will reach Khaosan Baan Thai.